College of Charleston Libraries / About / News / College of Charleston / Don’t forget to come to the Bryant Holsenbeck Exhibit opening this Friday! 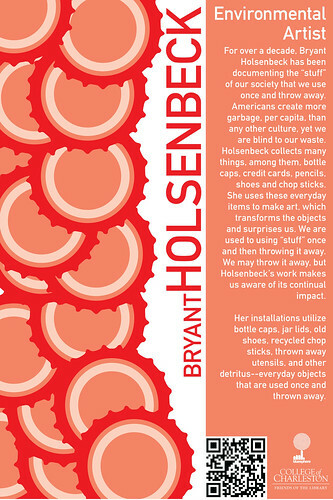 Don’t forget to come to the Bryant Holsenbeck Exhibit opening this Friday! Don’t forget to come to the Bryant Holsenbeck Exhibit opening this Friday (October 22) at 5pm-7pm in the Addlestone Library Rotunda! While you are there, take a moment to read the QR Code (accessible by a code reader app on your phone) on each poster to find out more about sustainability efforts at the College of Charleston. Need a QR Code Reader? Visit the QR Code Research Guide to Find one! Guests can also walk to the Halsey Institute for the Chris Jordan exhibit opening, Running the Numbers, presented by bluesphere: earth art expo. Photographs of Bryant Holsenbeck’s mini-residency at the College of Charleston posted with permission from Mark Sloan, Director & Senior Curator, Halsey Institute of Contemporary Art. Poster series designed by Jolanda-Pieta van Arnhem, Jerry Spiller and Ai Charleston student Marcello Garofalo. ← Bottle Cap Mandala Complete!